I had the opportunity to lead an very enthusiast group of students on a “Picture Yourself Downtown” photo safari through the streets of the downtown Las Vegas. This event was put together by Zappos and the Downtown Project as an on going effort to educate our children in the arts. We provided the kids and their family a list of items to include make me smile portrait and geometric patterns to look for to add structure during the city walk. The only rules for the walk were to have fun, explore creatively and frame it in their camera view finder. The kids photos will be posted at a later date. 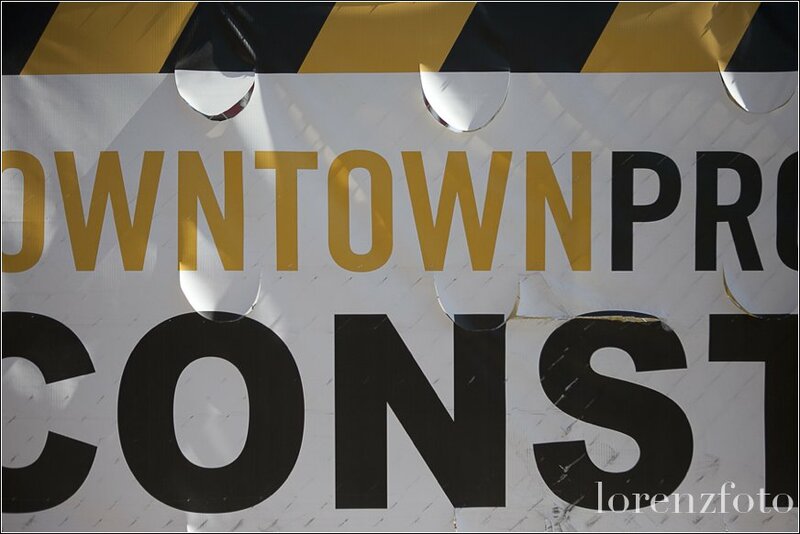 The Downtown Project group is committed to transforming downtown Las Vegas into a community-focused area by empowering people to follow their passions to create a vibrant, connected urban core.  At the heart of the project is thriving art, music, and creative culture. This is long over due–thank you!! The Downtown Project has been allocated $350 million to revitalization of downtown Las Vegas. The funds are being invested in buying real estate, small businesses, education, and tech startups. 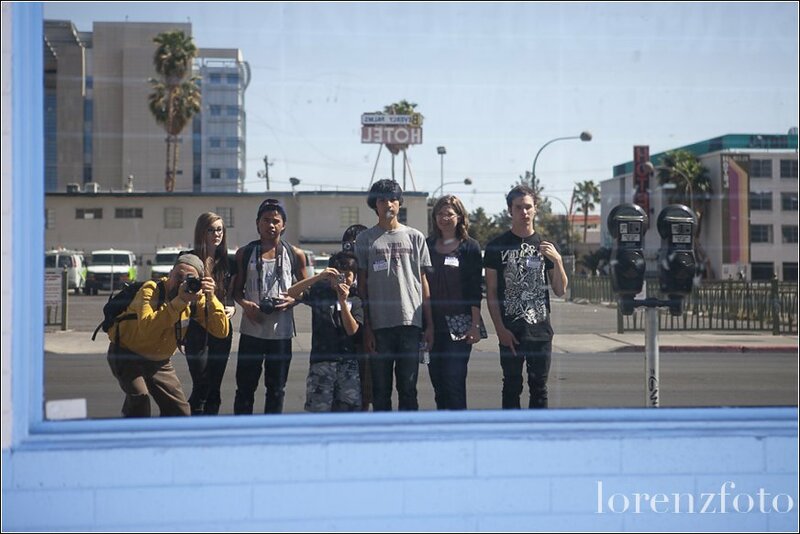 A downtown Las Vegas portrait photograph of the group shooting into the reflection of a story front window. Thanks for a wonderful experience! My boys are still talking about everything they saw and learned from you. A match meant to be. We are looking forward to their Las Vegas spring wedding. As a Las Vegas portrait photographer it is all about dealing with shadows, highlights and understanding how everything in between works in harmony to create an image. Unfortunately, I don’t always get the opportunity to determine what time of day I can photograph a client in their environment but I have to come home with the goods to earn my pay check. One of the greatest challenges to making a full tonal image during midday is to overpower the sun with my flash, move to shade or shine a reflector on your subject to avoid harsh contrasty tones. Must photographers favor running to shade to avoid the nasty results of raccoon eyes or a backlit scenario on their subject. Not one to avoid a challenge, I place my subject in between myself and the sun to create texture, dimension and mood. In the below photo I knew the sun would illuminate Jason and Harley’s right side, I exposed for the background and I had to balance out the shadows his face with an off camera flash left of the subject and this is what I came up with. Give me a call for your portrait. Tutu walked up to me after the January Bridal Spectacular fashion show and without any reservation asked if I would photograph her engagement session with a Vegas theme because both she and her fiancee Ib were from Africa. They wanted to show their family and friends back home their new city in the states. 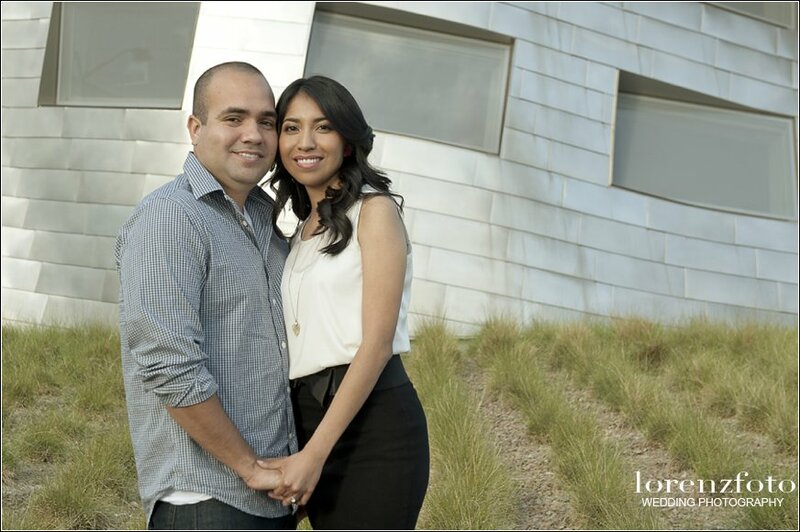 Feel the love, Tutu and Ib are happy to have found each other six years ago as students at UNLV, and ever since their relationship has grown. Their engagement session was at the beautiful European setting of the Ravella Lake Las Vegas and on the cobble stone streets of Monte Lago moments after the sunset. Wedding bells will ring during the summer of 2013 on a beach in Kenya. Beautiful shots! You captured their happiness perfectly..
We had the pleasure to work with a great team of dedicated wedding professional in preparation for the current edition of Spectacular Bride Magazine . Both Kristina and Jessica (our models) were beautiful and easy to work with throughout the afternoon. The JW Marriott’s European architecture setting was a lovely backdrop, coupled with the attention to details by all who participated made for a fabulous day. We are happy to announce our photo of Kristina was featured on the front cover of Spectacular Bride.